One of my favorite holidays is Halloween. I always found Masquerade balls fascinating and exciting. Cosplay was something I got excited about being popular. If you know me all of this makes sense. When I did a Cosplay it was Alice in Wonderland, a fictional ne'er do well who lives in dreams and nonsense. The fact I chose Alice to relate to made sense because she doesn't follow her own advice or intuition. As a result, she get's lost and in the end is hated. 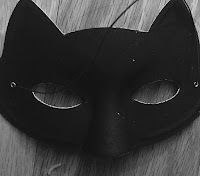 Masks, imagination, nonsense, and "play pretend", is where I live each day. Every day I live in a dream, a world of my own creation. I may at times be practical but I don't live in reality. Excuses and lies don't belong in reality. A few of the millions of excuses I've used for my behavior include a defense mechanism to survive the ugliness of life. Beyond all of my other faults I hide and runaway because I'm scared due to my insecurity. I'm emotionally dependent, selfish, and I lie. I lie to others because I lie to myself. I "play-pretend" every moment of every day. I believe whatever I want to believe and by doing so hurt others. To reinforce my fantasy world, I created Sophisticate in the Suburbs as a virtual mask. When I write I put on a mask to help others learn so they don't make the same mistakes. My failures and my failure as an individual gives me material to write. If I were a Sophisticate, Sophisticate in the Suburbs would cease to exist. Living my life would be enough of an example to others. When I ask "Are YOU Sophisticated? I am asking "Are YOU ready to be better than me?" The purpose of my virtual mask of Sophisticate in the Suburbs is to inspire others to be better and go beyond my failures.